The Optimum Outlet & Entertainment Center in Istanbul was looking for a new, sensational activity to attract more visitors to their shopping centre. It had to be an attraction that wouldn’t just draw more visitors, but that would also distinguish them from other shopping centres, and even better, turn it into something that serves an extra source of income. The choice for a skating rink was quickly made, but easier said than done. That’s because what the client wanted was a skating rink that could be open year-round. The challenge was that this skating rink needed to be realised in the middle of a covered shopping centre. As a consequence, the skating rink needed to be easily removable, as the limited available space also needed to be used for other purposes. In addition, a conventional permanent installation didn’t fit the allocated budget for either the purchase cost, maintenance or energy consumption. That’s why our client Paten Eğlence Hizmetleri Turizm decided to turn to the experts for advice on its next steps. This challenge is what led our client to Ice-World and our flexible skating rink system. Our recommended solution is easy to install or remove and can stay open all year. 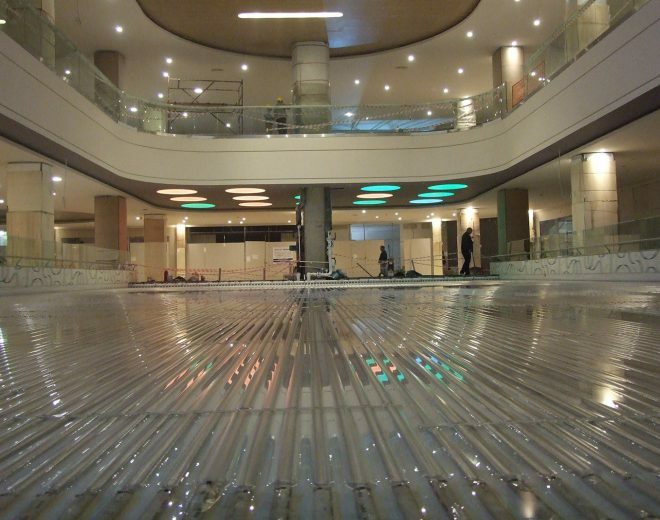 Moreover, there would be need for a layer of concrete to act as a subfloor, since the Ice-World skating rink can be installed directly onto a flat surface. After our product had convinced the client, an extensive cooperation was set in motion. This cooperation goes beyond simply supplying and installing the ice skating rink. We also advise and support the client on skating rink-related events. Thanks to the special lighting and sound effects, the skating rink has functioned as a backdrop to many different events already. In addition to its entertainment value, the skating rink is the lively home base of the local skating association and is used regularly for training by other skating associations and as a location for ice hockey competitions. We were very satisfied about the quality of the system itself and of the professional support of the Ice-World team. Our solution has proved itself time and again in practice: ten years on, the client still continues to praise the skating rink. Additionally, the rink is energy-efficient, with lower maintenance costs than those that would be required by a permanent skating rink. The Buzluk Buz Pisti, the skating rink’s name in Turkish, is the perfect match for Ice-World’s mission to connect people through unforgettable experiences: anywhere, any time and for every occasion. In combination with all the other available activities such as concerts, a children’s club and a cinema, the skating rink in the Optimum Outlet & Entertainment Center is the perfect destination for a relaxed, active day out!